Music capital of the world … check! Cool vibe, great bar and trendy restaurant … heck yeah! It’s all on the list and it’s the perfect location, downtown in Austin. The Westin Austin Downtown combines all the basic needs. They are right at your fingertips since the hotel is just steps from the city’s famed Sixth Street. 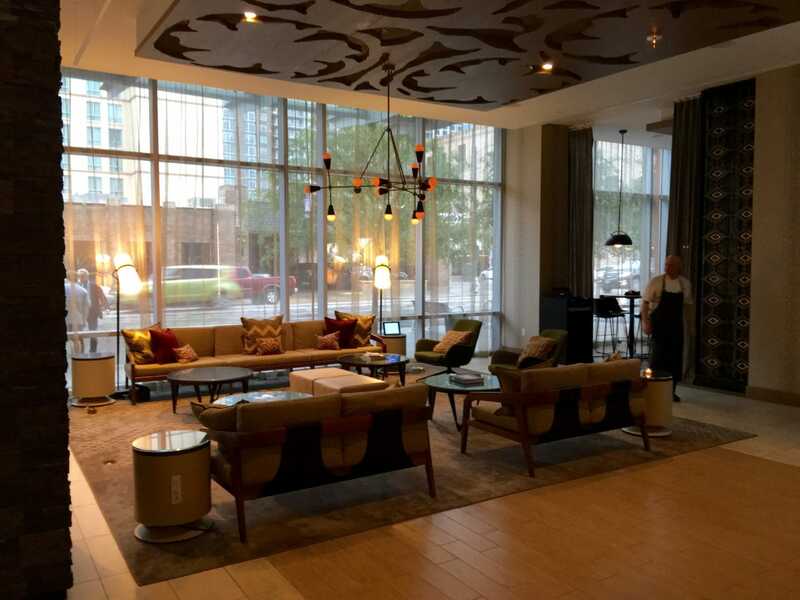 The Westin Austin Downtown is not hotel business as usual. Sure, you’re in a Westin, but in this particular property you get a local design that matches the tune of where you are staying. Paying homage to Austin’s musical heritage, the lobby interior vibe grooves to an instrumental piece of Austin’s musical backbone: the guitar. The wooden carvings in the lobby are reminiscent of Dobro cutouts. Everywhere there is a reverence to music. The carpeting looks like designs found on guitar straps. The tiles that encircle the pool on the roof are evocative of the hip tunes the city suggests. The best view in Austin is the name of the game on the roof, where as you’re swimming, you are also getting 180 degree panoramic views. Opened just two years ago, the Westin is light and new. The 366 rooms feature that famous signature Westin Heavenly Bed®, as well as the Heavenly Shower/Bath®. There are flat-screen TVs and an iHome docking station provided in the rooms as well. I didn’t stay in my room long enough to take advantage of all the amenities since the rooftop was calling. In addition to the pool, there is the well-stocked bar called Azul. Azul is Austin’s tallest hotel rooftop bar. In addition to the chance to swim, you can indulge in a cabana for canoodling or sit by the fire pit for evening drinks. The culinary scene at Westin Austin Downtown is more than just your hotel food. Executive Chef Michael Cerrie helms the Austin-American restaurant Stella San Jac. While you can enjoy breakfast, lunch or dinner, or even brunch on Saturday and Sunday, we ducked in for a quick dinner experiencing an assortment of Cerrie’s flavorful offerings. Count on eclectic dishes from gulf shrimp and lump crab rolls to short ribs and sweet potato mash. The signature #16 biscuits are legendary. The local craft beer menu is always updating and the seasonal cocktail options are creative and on point for the Austin weather. If you’re looking for ideas of the music variety, the concierge has the perfect list. The hotel offers a few one-of-a-kind experiences. One is putting a guitar in your room during your stay in case you get a hankering to play. You can take guitar lessons with a local artist on the rooftop, have VIP access to a local show in town or you can get access to a show at nearby Antone’s. If you aren’t familiar with Antone’s, that’s Austin’s famous blues nightclub where many a music legend has entertained. Other than Sixth Street, there is another entertainment district in Austin that’s really coming into its own. It is Rainey Street. There are a number of bars popping up in this area very near Sixth Street. We shared a few drinks with friends stopping in at a few top choices on our Austin bucket list. 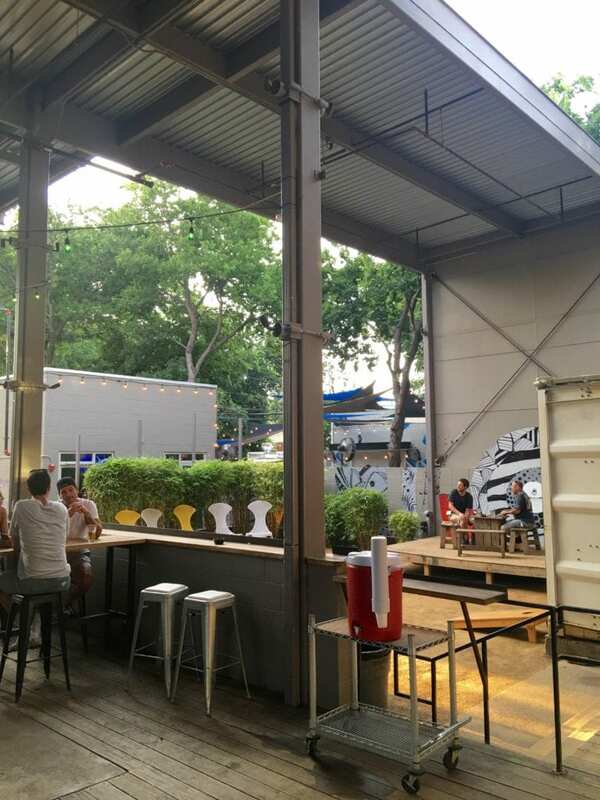 We had been eyeing the Container Bar from our last trip to Austin, so we had to see what all the fuss was about. It’s contemporary inside, exactly as the name implies. Made from used shipping containers stacked on top of one another, the Container Bar sits in the middle of a courtyard of trees. Clive Bar came highly recommended. 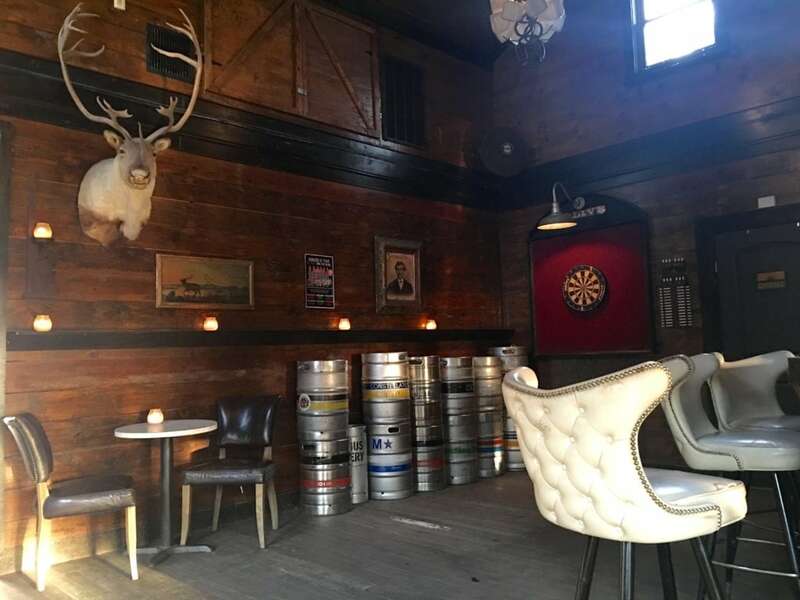 I had Kentucky Velvet while sitting against the dark wooden walls with one big elk overlooking the room. All this was greace with a lively outdoor patio which casually touts the real Austin vibe. We had heard there was a speakeasy in the back so we asked the bartender if he would show us what the fuss was all about. He did. The little backroom bar is only open on certain nights and sits behind the bigger bar – a room the mere size of a large closet. Behind the bar, it’s reminiscent of the prohibition days with a bit of modern brew for good measure. While many locals from the area fondly remember the days when Austin was just a little music town without all the people, the Texas music scene here smoothly continues to re-invent itself. 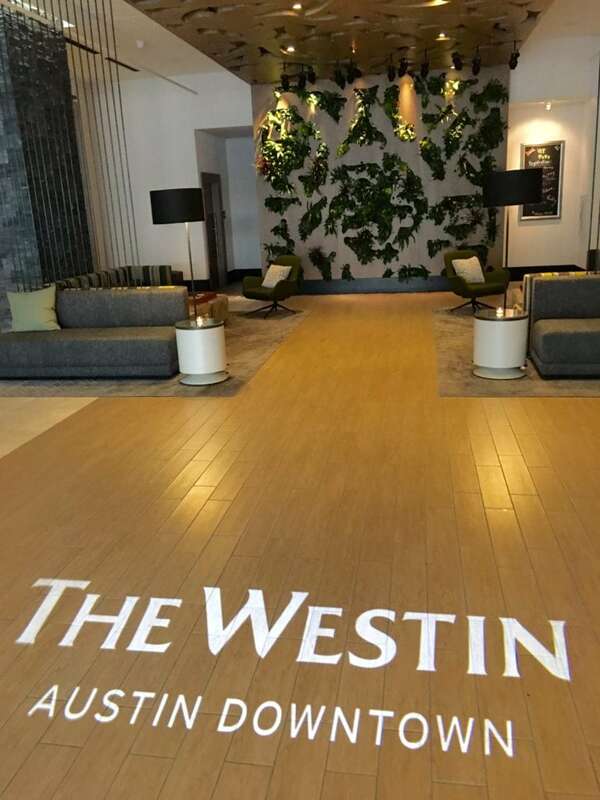 With the type of destination hotel like the Westin Austin Downtown, it’s the perfect niche location with an eye for detail that ideally matches the city vibe.